City Council Asks, What Would Mitch McConnell Do? Faced with a large crowd and an uncomfortable vote on a developer's Noise Ordinance waiver request they'd rather keep quiet, the Emeryville City Council last Tuesday night employed a new tactic in their ongoing effort to assist developers seeking favors from City Hall. After reading aloud a waiver request agenda item number (11.1), followed by an empty call for public comment, the Council moved straight to a vote; no staff presentation, no chance for the public to hear about the issues involved, no debate. It's a tactic that Washington DC's most effective Senate Majority leader in years, Mitch McConnell, would approve of and one, whom Tuesday's spectacle invoked. When it comes to developer's requests for waivers to our Noise Ordinance, since 2010, the City Council has shown remarkable consistency for approvals, denying only four out of 19 requests up until last year. The Tattler has long chronicled the pro-developer bias that exists at City Hall when it comes to these waiver requests, and the April 16th approval is just the latest in a long line, regardless of a new self proclaimed livability-friendly Council. Charting new territory, on Tuesday, the new Council agreed that since they had already heard a presentation about the specific noise waiver request in question at a previous meeting, they could dispense with another presentation and any public debate. This reasoning, erroring on the side of opacity in City government, negated the room full of people at the meeting, most of whom had not been at the previous meeting and whom had an interest in hearing about the request and being given a chance to weigh in. These are academic and picayune concerns for a City Council, wont to speed up government processes to help those who matter the most in Emeryville. Avoiding civic and personal embarrassment was likely on their minds as well. These tactics, the same as those taken up by the great turtle man in Washington notably also serve the same demographic. It would appear like minds think alike. We're looking forward to much more efficient City Council meetings and the chance to get home at a reasonable time, all that uncomfortable public debate having been found by our City Council to be unnecessary. The business sector helped, the public shut out, government streamlined....Mitch couldn't have done it better. 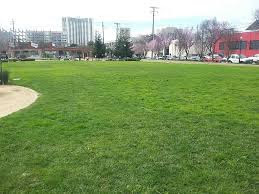 Emeryville City Hall recently hosted a meeting on the state of our city parks now and in the future, after which the citizen attendees and TV viewers came away happy, assured the City Council is working to provide all the planned new parks in town as they’re supposed to. Some may have gone into the meeting thinking there aren’t enough parks here but not to worry the attendees were told, the City Council is on it. The parks box is checked and everything's A-OK they learned. The citizens left the meeting happy…. happy but ignorant. 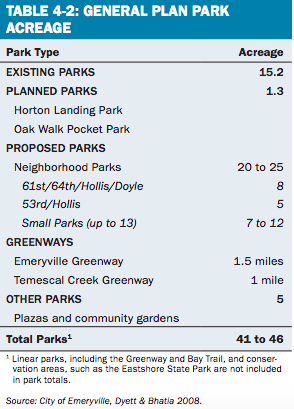 Were the actual facts about parks in Emeryville revealed, the departing citizens wouldn’t be happy. They’d be angry. Because there is a major problem with parks here. We’re not getting them. And that’s a problem not even admitted to by City Hall. What we ARE getting instead is agitprop and evangelism by our government. The meeting, on March 19th, is revelatory; it was set up to deceive and mollify the people. The City Council took pains to cajole the citizens into thinking they’re doing fine with the goals the City has with providing parks. They highlighted the two or so acres of parks they built over the last ten years and referenced their plan to build another three or four acres of parks that have been funded over the next several years. 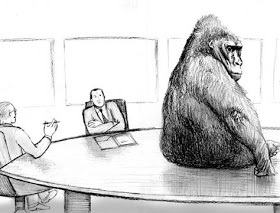 But what was brazenly left unacknowledged was the 800 pound gorilla in the room: Emeryville is midway through the 20 year General Plan and to satisfy it, the City needs to build not three or four acres but 26 additional acres of parks in the next ten years. Got that? Twenty six acres in the remaining ten years after having built only two acres over the first ten years. After joking about pressure coming from the Tattler on the issue, Mayor Ally Medina opened the discussion, adding some realism for better effect into the otherwise pure whitewash. She began by interjecting a little mea culpa contrition into the presentation, “We could do a little bit better of a job addressing, as we increase our density, some of this livability and park space for our ever increasing residential population.” she said. And then the propaganda whitewash began. says something different, but is ignored. 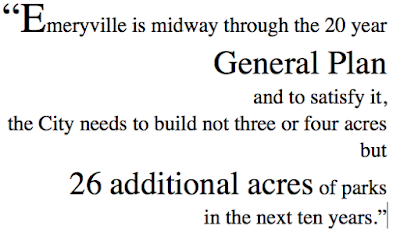 The General Plan is as clear as it is ignored: at least 26 acres of new park land needs to be built in Emeryville over the next ten years. But the March 19th meeting revealed City Hall has no intention to deliver on that. The abdication of its duty to the General Plan in general and parks specifically thus represents a public policy failure. The staff obviously put in many hours for the presentation that purposely left out the information the people need to know about the City’s failure providing parks. We want to know how much paid staff time was spent preparing this hood thrown over our eyes. As friends of Bill twelve steppers and other drug rehabbers are fond of saying, ‘the first step in solving a problem is acknowledging there IS a problem. And how it goes for addicts is true too for municipalities seeking to solve their problems. Cities need to admit they have a problem before they can move to fix the problem. The Emeryville City Council, going around telling the citizens they’re doing great with building the parks they’re supposed to provide, is reprehensible and irresponsible. The truth is that they’re asleep at the wheel, using the staff do do their dirty work and Emeryville residents are being cheated out of the parks we’re supposed to be getting. How Do We Know When We've Built Enough Housing? Councilwoman Martinez Says Emeryville Hasn't Built Enough Housing. Just about everyone knows at this point, that the Bay Area is in need of more housing. Developers and Wall Street concerns are united in agreement on this of course but so is the media and even academia's city planning cognoscenti. But what about Emeryville specifically? Does Emeryville need more housing? Emeryville has built a lot of apartment buildings over the years - more than our municipal neighbors have. Has it been enough? How do we know when we've built enough housing? for the Bay Area, it's true. 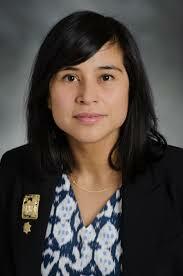 City Councilwoman Dianne Martinez says she knows; Emeryville hasn't built enough she says. Ms Martinez is unequivocal on the subject, "We really need more housing" she said at a recent City Hall study session without qualifying that sentiment. That statement isn't quantifiable because it isn't true. Ms Martinez posited an opinion as though it were factual. In fact, we know Emeryville does not need more housing. 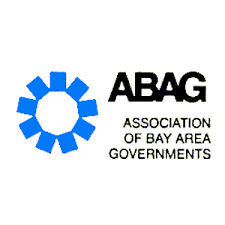 We know this because the premier housing authority in the Bay Area, the Association of Bay Area Governments (ABAG), of which Emeryville is a dues paying member, tells us Emeryville has been over-building housing since 1999. For the last 20 years, Emeryville has built more than its share of housing, more than what ABAG has recommended. Emeryville, as it turns out, is not part of the Bay Area housing crisis. At least not as far as market rate housing is concerned. Even as developers seeking to make a quick buck in our town and certain Emeryville City Council members with an ideological point of view argue that Emeryville must build more housing, ABAG's findings are as definitive as they are vexing for these two groups. The State of California has charged ABAG with compiling a cogent and rational housing plan for the Bay Area, assigning each city with a list of housing goals through a data base known as the Regional Housing Needs Assessment (RHNA; pronounced Reena). 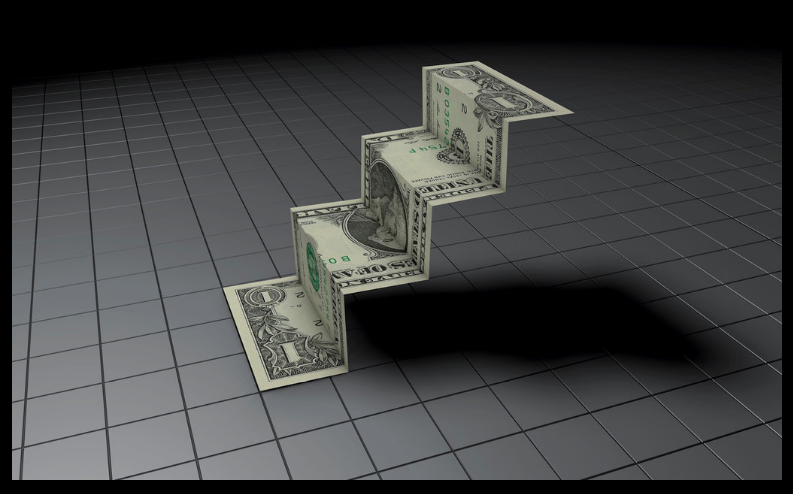 RHNA compiles the numbers based on equalizing several factors including matching the jobs a geographic region has or is anticipated to get to available housing. Each city is then assigned a number of homes it needs to provide sub-grouped into affordability categories. Emeryville, unlike many neighboring cities, has consistently over-built housing in the 'Market Rate' or 'Above Moderate' category. Sometimes by a huge amount. For instance in the critical years 1999 through 2006, Emeryville built total housing at 234% of RHNA recommendations with a whopping 525% of recommended market rate housing. And every year since 2006, we've continued to build more market rate housing than RHNA recommends, averaging 105%. Interestingly and to the developer's advantage, ABAG divides each RHNA implementation period into seven year time horizons and overages from previous periods don't have an effect on the new period's housing needs assessment. So Emeryville's massive overbuilding during the early 2000's doesn't drive down the amount of housing we're now tasked with providing; we still must continue to provide housing as if we were starting from zero. However, even without counting all the surplus market rate housing stock Emeryville built up over the previous implementation periods, the most recently completed period that ended in 2014 shows we've overbuilt market rate housing at 105% of RHNA recommendations. "We really need more housing"
us where she gets that information. The current RHNA implementation period, 2015-2022 shows Emeryville market rate housing at 60% of RHNA recommendations over a period of 57% of elapsed time, meaning we are building housing at almost exactly the rate recommended up until now. However, the 60% figure doesn't count the 500 homes that will be built at the Sherwin Williams Project, slated for approval later this year. With that project added to this implementation period, the 2015-2022 period will show Emeryville again well over 100% of recommended market rate housing. 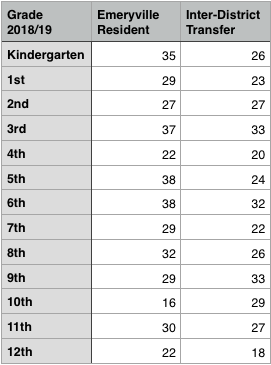 The ABAG/RHNA numbers reveal a city stepping up to the housing plate and then some. Indeed, Emeryville has bragging rights when it comes to doing its share of housing in the Bay Area. Yet, for all the over-building of market rate housing over the last 20 years, Emeryville is not taking any bows. Quite the opposite actually. The City has sought to actively downplay its housing record, suggesting more needs to be built. Planning Director Charlie Bryant even denied there has been an overage of market rate housing at all at a recent publicly held Residents United for a Livable Emeryville (RULE) meeting on the incipient 638 rental unit Onni Project slated for Christie Avenue. Ms Martinez steadfastly refused to tell citizens where she came up with her idea that Emeryville needs more housing, citing a City Attorney ruling that Council members not discuss the Onni Project with anyone either publicly or privately except the developer himself. The City is preparing for and greasing the skids for an onslaught of major apartment towers it anticipates in the coming years. The February 5th City Hall Study Session where Councilwoman Martinez revealed her opinion that we "really need more housing" is instructive; the Council is considering rolling back family housing regulations and our 'tower separation' regulations in order to accommodate much more market rate housing. Not satisfied with merely downplaying the RHNA numbers, City Hall so strongly believes in building more market rate housing that it is pushing to drop these regulations enacted in 2015 (after a year of public deliberations), all at the request of the developer of the Onni Project. Public policy is not based on politics or hearsay or rumor or assuaging the whims of any developer. Even billion dollar developers. Councilwoman Martinez's fatuous comments notwithstanding, we know how much housing Emeryville needs. There is only one repository for factual information about housing specific to Emeryville and that is ABAG and the RHNA. It is hardwired into the City's General Plan and is used to determine how much housing to build in our town regardless of what a misguided City Councilmember, the City Staff and a developer seems to think. Councilwoman Martinez says Emeryville hasn't built enough housing. How does she know? Ms Martinez on the Onni Tower Project: "Building housing is imperative..." "I'm loath to delay it..." "I don't want to see more study sessions...we need to move the ball forward"
"Onni will create a lot of housing at a time when we really need it [in Emeryville]"
From City of Emeryville ABAG's RHNA 199-2006 numbers: Emeryville over-built market rate housing at a rate 525% of recommendations. "...A Lethal Environmental Catastrophe Waiting to Happen"
Fargo bank building and FedEx/Kinkos building. undetermined number of daily car trips. 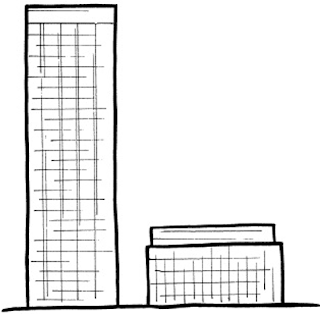 pounds of CO2 per hour that these two proposed buildings will inject into Emeryville's air. Every 24 hours the amount of CO2 will be 41,002.185 pounds or 20.50 tons of CO2. To check my calculations, I have also used an alternative method produced by the Carbonfund organization, and get a result of 17.6 tons of CO2 per day created by this building. by combining with the oxygen carrying hemoglobin of the blood to form carboxyhemoglobin. This reaction prevents oxygen from binding to hemoglobin, thus leading to anoxia (lack of oxygen). ozone. This occurs close to the site of emission. exposure to lower concentrations (such as through smoking) could harm unborn babies or cause neurological damage. minimum of 17.5 to 20.5 tons of toxic CO2 into Emeryville's air per day. family's health and the health of your local neighborhood environment? a disaster. Our planet earth is dying and a major reason for its accelerating death is the continued creation of architectural buildings, such as this one, which will add to the lethal CO2 content of our air, water and soil. We do not see this insidious attack on our air because it is up high, on the roof, where we cannot view it. Every day, we have the choice to mitigate and resolve our urgent dilemma of a dying earth or contribute to its on-going destruction. behemoth that silently contributes to the killing of our planet. Please consider carefully, and with informed study, the consequences of the existence of such an ecological and architectural disaster. Buildings, such as this one, are killing us and robbing our planet of what healthy future we have left. Eugene Tssui resides primarily in Emeryville since 1989 and has raised a family of five here. He is an internationally practicing architect, maintaining offices here and in Shenzhen, China, specializing in "true zero-footprint" and disaster-proof buildings. He graduated from the University of California, Berkeley, in 1989, and holds an Interdisciplinary Doctorate in architecture and education, and two Masters Degrees in architecture and city and regional planning. Dr. Tssui is the author of seven books on architecture and ecology and has been a professor of architecture and ecology at UC Berkeley and Beijing University in China. He was a Harvard University Research Scholar in 2011 and 2012. His articles on architecture and ecology have been published globally in over 100 magazines and newspapers ranging from Nature magazine to the New York Times. Recently, he has been involved in designing the tallest building in the world, in development for Shanghai, China, using the natural ambient temperature of the Earth as a passive heating, cooling, and ventilation source and thus having no ecologically destructive HVAC (Heating, Ventilation, Air-Conditioning) systems. 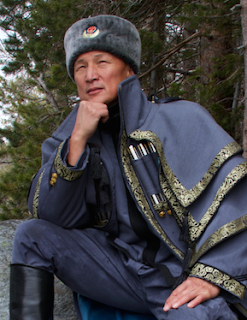 Dr. Tssui has been featured on global television programs such as National Geographic, the Discovery Channel, the Learning Channel, the History Channel. PBS CNN, NBC, CBS, The McNeil/Lehrer Report, the BBC, MTV and CCTV television in China, and Nippon TV in Japan, and has been the recipient of grants from the National Endowment of the Arts and the Graham Foundation. Dr. Tssui was recently bestowed the title "Guardian Angel of the Planet" with Jane Goodall and Jean Michael Cousteau, by Multivu News, New York. The resident advocacy group RULE invites all interested to attend our meeting Saturday, March 16 in the community room of Doyle Street Co-housing in Emeryville, 5514 Doyle Street. Both Council Member Dianne Martinez and Planning Director Charlie Bryant will be in attendance. 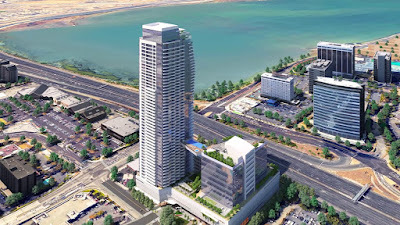 We will be discussing the proposed Onni Tower at Christie Avenue and Powell Street in Emeryville. 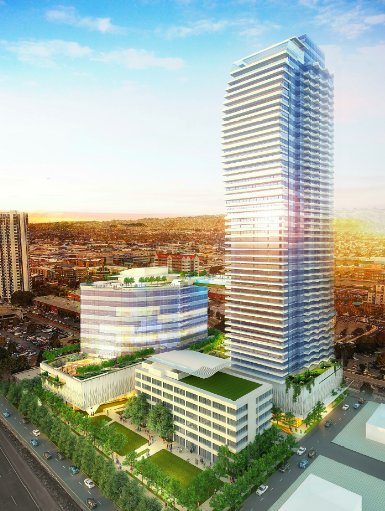 The luxury residential (and office/retail) project will be 54 stories (+ parking, close to 700 feet in total building height) and contain 638 units for more than 1,000 residents. It is comprised primarily of market rate studios and one-bedrooms. The developer has included the required minimum 17 percent affordable housing, but is below the number of two- and three bedroom units required by city ordinance. 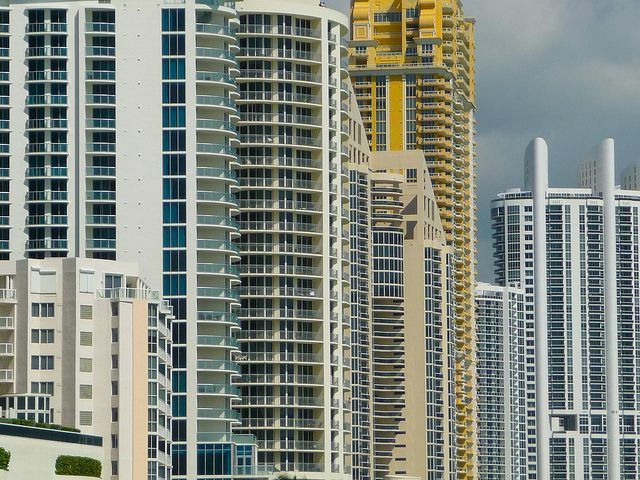 Twelve of the 55 three-bedrooms will be located on the tower's penthouse and "sub penthouse" floors. 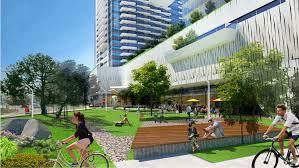 There will also be a half acre park fronting on Christie Avenue. Council Member Martinez said she will be available to hear residents concerns and feedback, and Planning Director Bryant will answer specific questions about the proposed plans. Mr. Bryant has requested a list of questions beforehand, so please email Lillianschroth@gmail.com with your Qs by end of day Tuesday, March 12 and she will send a summarized list to Mr. Bryant. The goal is to allow everyone an opportunity to speak at the meeting, from 10 am to 12 pm Saturday, March 16.
running roughshod over Emeryville's General Plan. The developer of the proposed Onni Tower, a 54 story residential development on Christie Avenue, has been lately shopping the project before citizens around town, standard fare in the pre-approval state for proposed development in Emeryville. So far it's been drawing the usual chorus of neighborly concerns over the myriad negative impacts such a large development would bring. However one overlooked issue with the Onni project, heretofore not in the eye of Emeryville residents, presents itself as a result of the tower's 1100+ new residents that could prove to be impactful not for the residents but instead for the developer. That issue is parks. The Onni project developer as it turns out, needs to provide more than three and a half acres of new public park space in town to offset all the new residents and new employees that project will bring- some three acres more than what's being proposed. That's three and a half acres total of new park land for Emeryville because of this single project if when it comes time for final approval, the City Council is in a mood to enforce Emeryville's General Plan. additional three acres off-site is needed. Because the site isn't large enough for that much park space, in order to comply with the General Plan, the Onni developer would have to provide the money for Emeryville to build at least three acres of parks elsewhere in town in addition to the half acre park planned for the actual site. If the City were to build all the off-site Onni generated park space in one location, at three acres, it would be the second largest park in Emeryville, smaller than Marina Park but more than double the size of the next largest Doyle Hollis Park with its one and a quarter acre. would have to be more than twice as large as this. And that's not all. 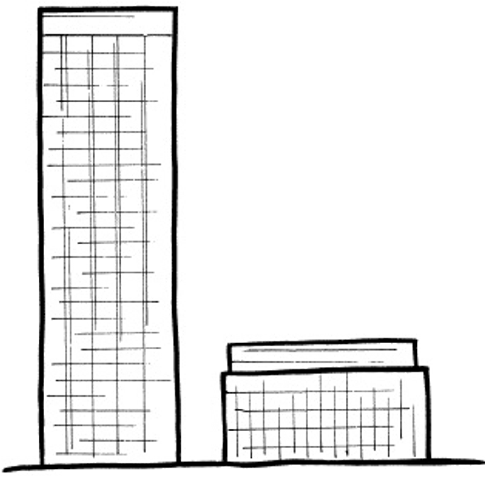 If the City Council grants the Onni developer a full or partial pass on the City's new family housing unit mix regulations as it is considering doing, that would mean more studio and one bedroom apartment units in the 700 foot tower, adding to the population and driving up the acreage of parks needed to offset it. The amount of extra park acreage that condition would generate is hard to calculate, contingent as it is upon how far the City Council rolls back the regulations for the developer. Despite its clear mandates, Emeryville's central guiding document, the General Plan and its provisions for parks, are not even being discussed by the developer or the City staff as the Onni project moves forward through the approval process. It's part of an ongoing case of willful amnesia the City of Emeryville has historically had when it comes to the General Plan's park provisions. Parks are extremely popular with Emeryville residents. Polls conducted by City Hall over the years have revealed as much. Candidates for City Council are all acutely aware of it; regardless of their political leanings, they routinely place the building of more parks front and center in their campaign literature. Surprisingly though, Emeryville residents are still dramatically under served in parks and open space. In 2009 when the General Plan was adapted, there were 15 acres of public parks. Doyle Hollis Park at 61st and Hollis streets was added shortly after bringing Emeryville's total up to about 16 1/2 acres in a city of 10,000 residents. That works out to an anemic 625 residents per acre, and that doesn't include the daily workforce of 20,000 using the parks, making Emeryville the most park poor of any city in the entire East Bay. The General Plan, rising to the challenge, recognized the need for more parks and standardized city planning metrics were applied to determine how many acres of parks our town needs. The nation's premier city planning collegial body, the American Planning Association (APA) provided the justification of a minimum of three acres of parks per 1000 residents or 333 residents per acre and that was adapted in 2009 for all new development in Emeryville. Also included in our General Plan are provisions recommended that a minimum of one quarter acre of park land is needed to offset each 1000 daily workers. 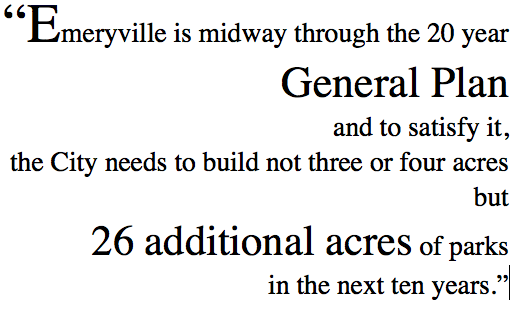 At the current approximate 20,000 workers city-wide, Emeryville needs to add another five acres. With a projected 30,000 workers in 2029, the sunset year of the General Plan, the daily workforce offset needed would be seven and a half additional acres of parks. The Onni project, with its 325,000 square feet of office space plus 20,000 square feet of commercial space at the standard average of 151 workers per square foot translates into one half acre of park space the developer needs to provide to offset. the year the General Plan sunsets. While Emeryville has added some park land over the last ten years, approximately two acres, that's not been enough to keep pace with our burgeoning population rise, contributing to a downward sliding ratio expressed in our lowest-in-the-East Bay population per acre of park land. 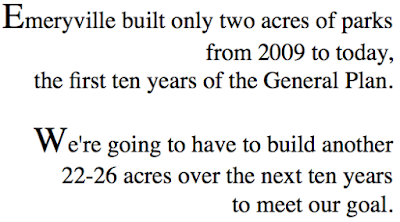 So regardless of the three acres per 1000 residents as the guiding principle spelled out in the parks section of the General Plan, Emeryville is now actually worse off than it was in 2009. With its current 13,000+ residents, Emeryville has only 17.8 acres of City parks. 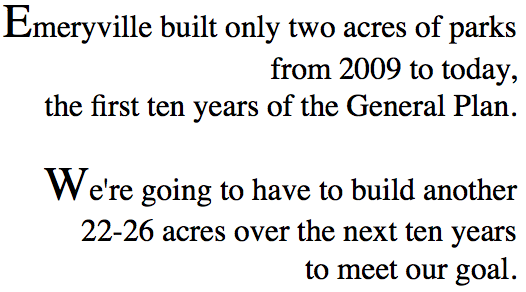 That translates to an embarrassing 730 residents per acre for our town and that doesn't include the daily workforce. Against this rueful backdrop, Councilman Scott Donahue appears to be doubling down on the City's inaction on parks. Citing the need for "close by" parks for residents instead of increasing park acreage, Mr Donahue is calling for Emeryville to use a new metric to measure how well the Council is doing on providing parks; namely how many people live within a half mile radius of a park, rejecting the General Plan's three acres per 1000 residents metric. Conveniently, Councilman Donahue's new way of measuring shows the City as a smashing success on parks and getting better every year since more than 90% of Emeryville residents live within a half mile of a park. Emeryville's new mayor, Ally Medina, acknowledging the poor record of the City and eschewing Council member Donahue's park proximity metric for measuring the City's park performance, is pledging to do better. Calling herself the "parks mayor", Ms Medina says the General Plan will no longer be ignored with regard to parks. Emeryville's 'parks fee' it charges developers has not been up to the task of actually building any parks because the amount City Hall receives doesn't match the costs the City incurs with building parks here. Adding new parks has become extremely expensive and there has been talk of getting the property owners in town to pay for it by floating a municipal parks bond. Because almost all the land has buildings on it, the City will have to buy land from reluctant sellers or seize it by eminent domain. Then the businesses on the site will have to be moved, the land cleared and cleaned up before the actual park can be constructed. It should be noted the fallow Sherwin Williams site provided the City Council last year an inexpensive way to build a large park but they chose instead to approve development of several large apartment blocks, further exacerbating Emeryville's already bad residents-to-parks ratio. The costly nature of new park construction and City Hall's limited funds to build them thus serves as a motivator in getting the developers to help pay for the new parks. Especially because it's the (residential) developer's projects with all their new residents who want and need uncrowded parks that are the reason Emeryville must build more parks. create additional parks and open space, and to provide public facilities and services that meet the needs of the community."